Winter casts a magical spell on the mountains west of Boulder, where summer trails transform to fairytale scenes draped in frosty flakes. 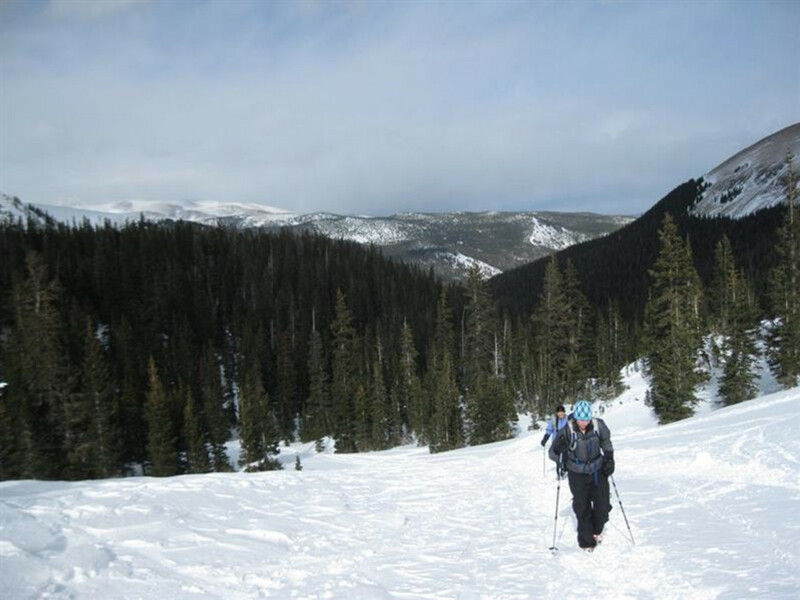 Whether you prefer charging hard up the hills or meandering along with more relaxed strides, snowshoeing is a perfect way to explore the winter landscape. Drink in the serenity, lose yourself to the methodical pace of each snowy step, and keep an eye out for wildlife tracks. 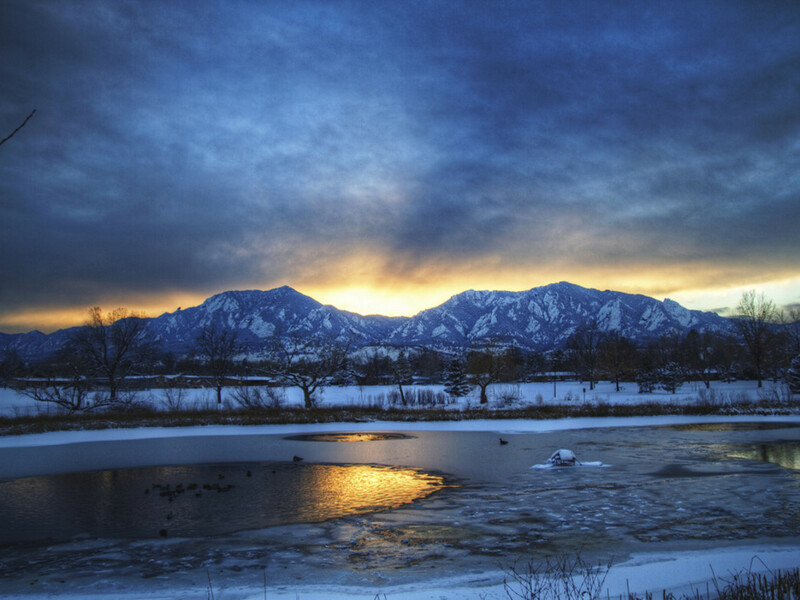 Here are five top places for snowshoeing near Boulder, each within an hour’s drive of the city. 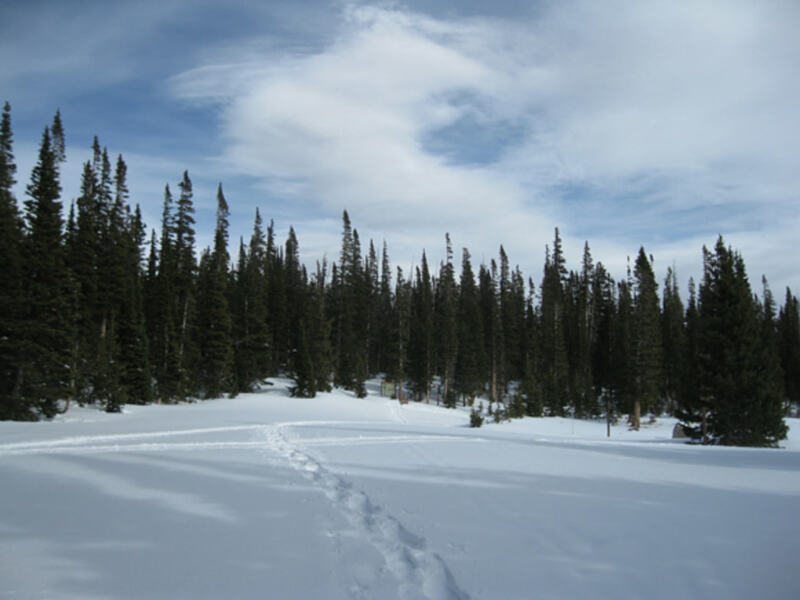 Just an hour from Boulder, Brainard Lake , which is part of Brainard Lake Recreation Area , is a snowshoeing paradise, with a diverse network of interconnecting trails for all levels, some built specifically for snowshoeing. The stunning backdrop of Indian Peaks Wilderness, whose summits poke up above 13,000 feet, guarantee jaw-dropping views as you explore the alpine forest. Park in the lot by the winter closure gate, which is 2 miles down the road from Brainard Lake. You can walk along the access road (closed to cars in the winter) for a casual stroll, or follow the Waldrop or CMC trails for a longer, more meandering route to the lake. From there, you can continue trekking to Long Lake and beyond. Those with significant pep in their step might consider huffing to the summit of 13,233-foot Mount Audubon. Be prepared for whipping winds above the treeline. On weekends, stop in at the Colorado Mountain Club’s Brainard Cabin, where volunteers hand out steaming cups of hot cocoa between 10:30 am and 2:30 pm. Alternatively, explore the Sourdough Trail, which leads from the Red Rock Trailhead on Brainard Lake Road north to Beaver Reservoir and south to Rainbow Lakes Trail. If you want to make a day of it, consider shuttling cars for a point-to-point adventure along this scenic route. The Colorado Mountain Club map offers additional information on trails in the Brainard Lake area. Southwest of Nederland past the tiny town of Eldora, the Hessie Trailhead is a stunning gateway to the Indian Peaks Wilderness, with miles of trails to explore. Starting around mid-November, the access road is covered in snow, so you’ll have to hoof it about a mile to the trailhead. From there, follow the gradual, well-trodden 1.5-mile trail to Lost Lake, a scenic alpine lake surrounded by jagged peaks. Expect to have company, since this a popular route. If you want solitude, follow the King Lake, Woodland Lake, or Devil’s Thumb trails, which extend for miles and could make for an all-day affair. These routes are less traveled, so be prepared to break trail and know how to navigate through the woods. It’s rare that snow sticks around Boulder for long, yet a few weeks each year, there’s enough powder to snowshoe in the hills on the western edge of town. Green Mountain rises to a lofty 8,144 feet, creating an adventurous goal for a snowy day and a rewarding experience with spectacular views. Start at the Gregory Canyon Trailhead off Baseline Road. If the access road is still closed due to flood damage, park on Baseline or at Chautauqua Park. Choose from several routes up the mountain—the steep stairs of the Amphitheater, the gradual grind up Gregory Canyon, or the twisty route past Saddle Rock. Where these trails merge, the dog-friendly Ranger Trail or the hiker-only E.M. Greenman Trail lead to the peak. No matter how you slice it, the 2,200-foot climb is a lung-busting grunt. At the summit, scale the rocky top and take in views of the Indian Peaks to the west and Rocky Mountain National Park to the north. Some sections of the trail might be trodden and slick. Sometimes a combination of micro-spikes at the bottom of the trail and snowshoes at the top is best, but after a big storm, you can snowshoe all the way. 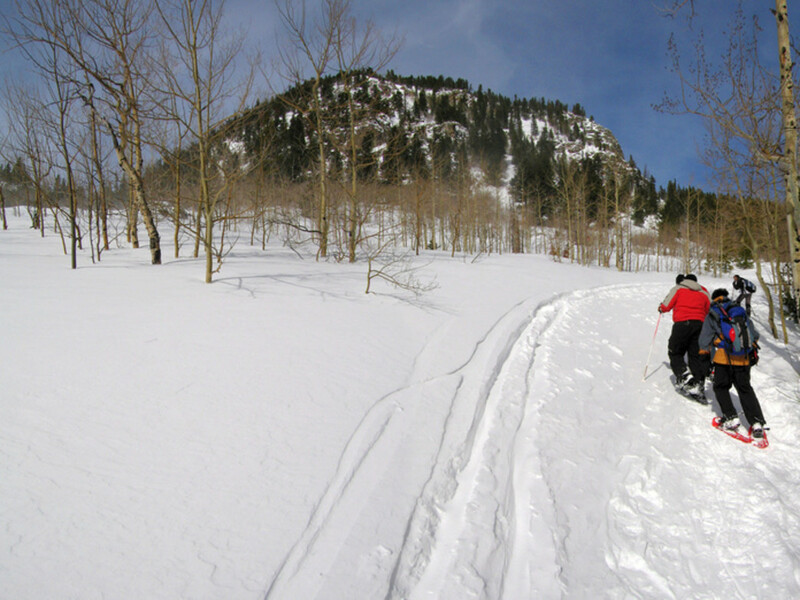 About 10 miles up Flagstaff Road at 7,240 feet, Walker Ranch stays colder and holds snow better than other trails in Boulder, making it a delightful snowshoeing destination. The 7.8-mile loop is a great workout, climbing up and down a total of 1,600 feet, so make sure you’re feeling fit. Along the way, take in the peaceful mountain scenery, complete with meadows, pine forests, rocky outcrops, and the tumbling waters of South Boulder Creek. Keep an eye out for wildlife and tracks in the snow; mountain lions roam the hills here. From the main parking area, you can follow the trail in either direction. Allow about three hours for the full loop, or do an out and back in either direction. Left (clockwise) brings you immediately to the highpoint of the trail before descending a series of switchbacks into the deep forest. Or start out to the right (counter-clockwise) to descend immediately down to the creek, which makes for a quick out-and-back burn if you’re short on time. Do the whole loop in either direction, and you’ll face a couple of stout climbs and steady descents. Just an hour from Boulder near Rollinsville, the Moffat Tunnel Trailhead (also known as the East Portal Trailhead) starts at 9,320 feet, adjacent to where a nearly 100-year-old train tunnel bores through the Rocky Mountains. From here, pick your potion: snowshoeing options range from easier jaunts to epic adventures. The parking lot is notoriously windy. Don’t let this deter you—it dies down once you enter the trees. The well-marked South Boulder Creek Trail begins on the north side of the tracks and heads into the woods. After 1.25 miles, the trail splits. Head right to get to Forest Lakes (3 miles from trailhead) or Arapahoe Lakes. If you stay on the South Boulder Creek Trail, you can climb all the way to Heart Lake above 11,000 feet, or follow another split to Crater Lakes. The signage for the area is intermittent, so good navigation skills are a must. If you’re seeking a mellower day, consider a stroll along Moffat Road, a 4x4 road that is accessible before you reach Moffat Tunnel. 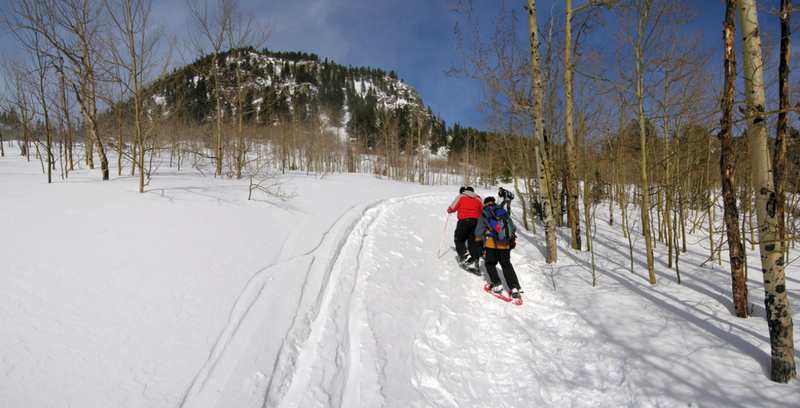 Tours: If you’re not comfortable snowshoeing on your own, sign up for a guided tour with Colorado Wilderness Rides and Guides. Retailers: REI in Boulder rents snowshoes.